Very satisfied with overall rental, great management and a wonderful home with a beautiful setting. Will definitely book again! The Glen: Cute house in a great neighborhood with manicured lawns and beautiful views of the mountains. Beautiful kitchen and large dining table was perfect for our family get together. Very satisfied with rental overall and service received. Very likely to rent from us again. "Bogarts was wonderful. The employees at the ski area were exceptionally nice and friendly." Pine Ridge Paradise: Great stay. Amazing views. Perfect place for a big chill weekend. Loved the patio and hot tub. A Chalet Our chalet was very homey, yet roomy enough for all 8 of us to share. Much nicer than a motel stay - easy access and close to town. Nice and quiet also! "Everything was clean and well stocked. Beautiful home, great location! It was very convenient that our lift tickets were here in the rental. The condo/townhome was ready for our arrival (keys/tickets.) Great service! We loved Foster & Logans, Brewery, Snag Bar, Boulder Creek, Bowling Alley, close to the ski station for rentals." Very satisfied with "cleanliness, accommodations, kitchen. Kitchen appliances were awesome!!" Local Shout-outs "Cafe Regis, Bridgecreek, Las Palmitas, IGA." "Heather was awesome. From the time we started looking to the time we checked in. It was nice to nice to have a house vs a hotel room so we could lounge more. It didnt cost much more because we would have needed 2 hotel rooms for our 7 people. Local Shout-outs: "Pizza Co.- Awesome! Foster & Logans- Awesome! Red Lodge Mountain - Awesome! We had a blast. We will be back!" "Everything was great, hot tub, cozy beds, homey, comfy, clean, and easy to find." He says the staff was "very informative and good communication lines." "A great family home - welcoming and comfortable. So many amenities - even breathe right and cough drops. We look forward to coming back! Hot tub was awesome even in the snow!" This was the nicest place weve ever stayed in and weve been coming here for 10+ years! Everything was provided for us - even extra towels for the hot tub! The kitchen was fully stocked with dishes and big bowls for popcorn! Everything was in working order, the condo is new, spacious and super comfy. Like a home away from home. The price cant be beat! For four adults it was less than staying at one of the local inns/hotels/motels with much better amenities and the ability to cook, have privacy and be right next to the mountain! Thank you so much! The condo is exceptionally nice and very clean. The kitchen has everything we could want. This is so clean I felt I could go barefoot, which I did! There wasnt an iron, but when we called for one, it was delivered within 20 min....Impressive :) Thank you for providing a warm and relaxing place to stay. We had a most wonderful stay here. The home is beautiful, clean, comfortable, well-stocked and convenient. We hope to visit again soon! Perfect for our four-family vacation! Home is in a great place, beautiful everything! You made our honeymoon perfect. What a great place to have our family reunion!!! We thoroughly enjoyed the house and plan on coming back. Thank you. It was great! Wonderful place to come. Hope to come back next year. We loved everything. It was nice to come home to every night. Very satisfied with cleanliness, location, hot tub. Thank you so much for sharing your beautiful home with our family. It is the most amazing example of restoration done right! Beautifully appointed down to the smallest details & having all private baths was great! Thanksgiving dinner was a breeze in your fully furnished kitchen & the dining table is so spacious...Amazing! We enjoyed every minute of our time spent in your home and the quaint Red Lodge community. We will be back without a doubt! Thanks! 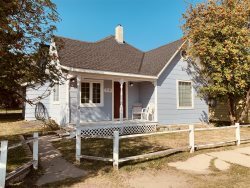 The Two Pines property in Red Lodge is the perfect home when passing through this area. There is an easy walk to downtown shopping. We loved the privacy of the backyard and the cottage is very nice. We just arrived home from our wonderful family vacation with Red Lodge Rentals. Sad to be home, but so happy to have found such a fabulous entity as yourself to continue to book our vacations through. This is our second time using your services. I cant tell you enough times what a positive experience it has been. I continue to sing your praises with whomever I come in contact with. Thanks for a great vacation, well continue to recommend you and look forward to our vacation next year. Thanks again! I was very satisfied with my stay in this very clean and comfortable condo. If I have the possibility, I will return.